Monday Oct 16, 6-8pm in Room 2504 in the AMS Nest. 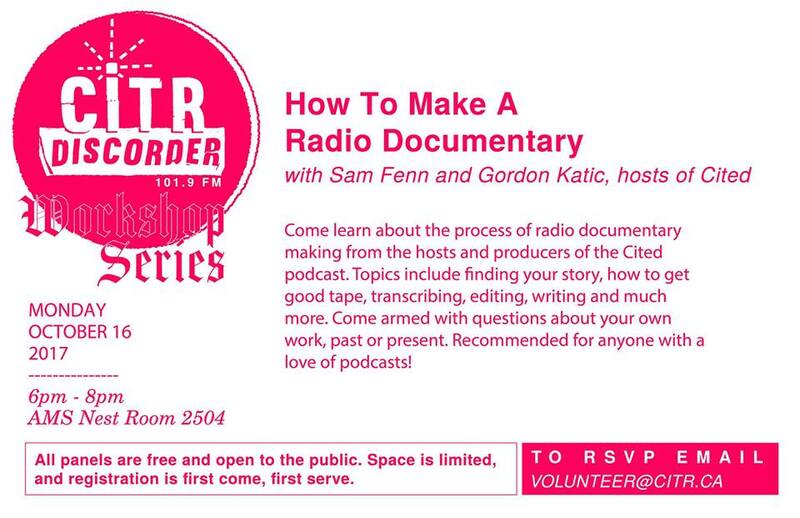 CiTR and Discorder are excited to present How to Make A Radio Documentary, hosted by Sam Fenn and Gordon Katic, hosts and producers of Cited. Come learn about the process of radio documentary making from the producers of the Cited podcast. Topics include finding your story, how to get good tape, transcribing, editing, writing and much more! Come armed with questions about your own work, past or present. 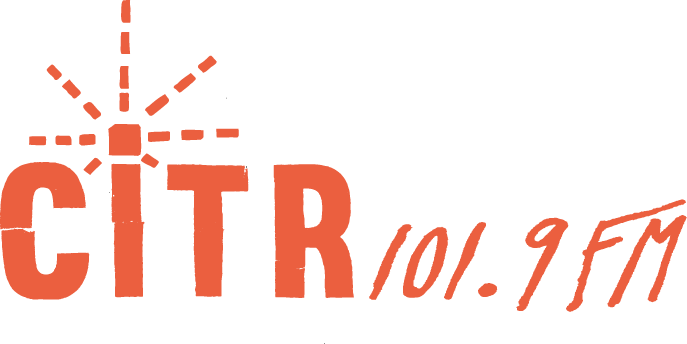 This workshop is mandatory for anyone applying for a CiTR documentary project (more info to be announced soon) and will be interesting to anyone with a love of podcasts! Cited is a documentary radio show about ideas that change the world, sometimes in troubling ways. Each week hosts tell stories about higher education and research; the birth, life and death of academic ideas; and expertise–who has it, what are they doing with it, and what are its limits? Cited has played nationally on the CBC Radio shows The Doc Project and Podcast Playlist as well as on NPR-affiliate station KUOW and over 100 campus and community radio stations across North America. The podcast has won national radio awards in Canada for three consecutive years. Workshops are free and open to the public, but space is limited! Email volunteer [@] citr.ca to reserve a spot! The workshop is located in Room 2506 of UBC’s The Nest at UBC. The Nest is located at 6133 University Blvd at UBC, which is accessible via bus numbers #4, #9, #17, #25, #33, #41, #43, #44, #49, #84, #99, #258, #480. Room 2506 is located on the second floor of the Nest. The door to enter the room is 34″ wide. The workshop capacity is 20, and we will let attendees know if the RSVP list fills up, though we do not anticipate this. There are gender neutral and accessible washrooms on every floor of the Nest.